Polling for the final and seventh phase begins in Uttar Pradesh today. 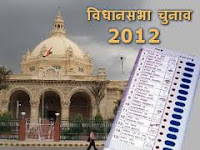 The final phase would cover Bijnore, Moradabad, Bheem Nagar, Rampur, Jyotiba Phule Nagar, Badaun, Bareilly, Pilibhit, Shahjahanpur and Lakhimpur Kheri in which more than 1.82 crore voters are expected to exercise their franchise. Besides Samajwadi Party's Muslim face Mohammad Azam Khan, who is contesting from Rampur, fate of minister in Mayawati government Omvati from Nagina seat, BSP MP Jugal Kishore's son Saurabh from Kasta and Rastriya Parivartan Dal head DP Yadav, considered heavyweight from Sahsawan seat, would be decided in this concluding phase. The impact of BJP MP from Aonla Maneka Gandhi, her son and BJP MP from Pilibhit Varun Gandhi, Union Minister and MP from Dhaurara seat in Lakhimpur, Jitin Prasad and Congress MP Azharuddin in their constituencies would be keenly watched by political observers. In the 2007 assembly polls, out of 57 constituencies BSP had emerged the biggest party bagging 27 seats, while SP and BJP had got 17 and nine seats respectively. While Rashtriya Parivartan Dal (RPD) of DP Yadav had got two seats, Congress and others got one seat respectively. After denial of his entry in the SP, Yadav has fielded candidates from his own outfit. SP has also put all its strength to increase its tally in these districts. Rashtriya Lok Manch of Amar Singh and local Rampur MP Jaya Prada's influence would be on test as they tried their best to ensure defeat of Azam Khan in his home turf As far as Congress is concerned, impact of party general Secretary Rahul Gandhi, who addressed 211 rallies and conducted roadshows covering 18 assembly constituencies from November 14 till 29th February including this region would also be at test in this phase.